I know that the theatrical version of this film was released in 2007 and that for some of you this review may be old news. But I only watched “I’m Not There” recently, so bear with me for a second. “I’m Not There” is supposed to be a homage to Bob Dylan, depicting the songwriter’s life and music in his various creative stages. 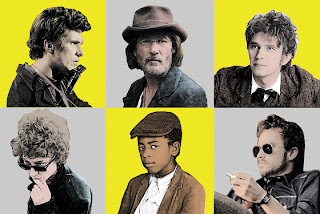 However, this is where the problem starts: director Todd Haynes chose six actors to each portray a personality of Dylan; from poet to outlaw, from actor to troubadour, from prophet to born-again Christian (and no character in the movie is actually called “Bob Dylan”). Christian Bale, Richard Gere, Heath Ledger, Marcus Carl Franklin, Ben Whishaw and (believe it or not) Cate Blanchett are all Bob Dylan. The film jumps from one Dylan to the next and back again, changes from colour to black and white and doesn’t seem to follow a narrative. Devout Dylan fans might argue that the movie is like one of his best songs, irritating yes, but great nonetheless. Don’t get me wrong, the film has some great parts to it. The delicate love scenes between the late Heath Ledger (rather fittingly as a James Dean-like idol) and Charlotte Gainsbourg are sweet but sad. Richard Gere as an aging version of Billy the Kid is so unlike the roles he is mostly known for. However, the one outstanding performance in the movie is by the only woman portraying “The Man”. Cate Blanchett’s version of the drug-addled, rock ‘n’ roll anti-prophet with curly hair and sunglasses is probably the closest the entire film comes to the real deal. Marcus Carl Franklin, who plays the 11-year-old African-American kid as one of Dylan’s personas, should get a mention too. I daresay “we ain’t heard nothing yet” and that this musically talented kid can go far. None of the actors in “I’m Not There” is really allowed to shine, though. The chaotic cut of the movie, the skips in chronology and lack of a centre make this film hard to follow. Its entire 135 minutes have you trying to find some kind of sense in the chaos, but the end only leaves you asking for the clue to the riddle. Even the critics don’t know what to make of “I’m Not There”. While the Boston Globe praises Haynes for managing to need “only six actors to show the various faces of Bob Dylan” and the Rolling Stone calls the movie a “feast for the eyes and ears”, The New Yorker thinks that it “makes Yellow Submarine look like a miracle of sober narrative”. The San Francisco Chronicle even goes as far as saying that “anyone can make a bad movie, but it takes a good filmmaker to make one as bad as I’m Not There”. Personally, I agree with The New Yorker’s view. It’s not a bad movie per se, and the soundtrack is brilliant (purely Dylan, as one would expect in a biopic), it’s just the chaos that weighs it down a lot. I think if the six segments of Dylan’s character were actually put in chronological order, the film would be far more enjoyable, not just for Dylan novices. “I’m Not There” is an attempt to achieve the cinematic equivalent to a Dylan song, but I don’t think the movie does his legacy any justice. On Wednesday, I went on a daytrip to Glasgow with my tourism class. We caught the train at 8.26am from Carlisle, and about an hour later, we were in Scotland! Magic! Anyway, with blue skies ahead, we decided to walk from Central Station all the way to Kelvingrove Art Gallery, because we knew the nice spring weather wouldn't last long. We decided to approach Kelvingrove through the park, and it was a nice surprise to leave the industrial city and its greyness behind and step into the world of spring with flowers and trees in blossom (finally!) and kids playing in the park. Kelvingrove Art Gallery in itself was quite a surprise. Purpose-built as a museum at the turn of the century (19th to 20th, that is) it could be anything from the outside. It could easily have been part of a church complex, a function hall with ballroom, even part of the University. It's huge! And very interesting in it's quite eccentric collection! On the one hand, you find armours from all over the world, a spitfire, examples of Glaswegian textile and furniture design - and just across the hall you find works by Auguste Renoir, Claude Monet, Vincent van Gogh and Salvador Dalí. Admission is free, it's easy to get to and well worth spending an hour or two browsing through. Back in the city centre, we walked straight past the Willow Tea Room, one of Rennie Mackintosh's most famous sites in Glasgow. You can easily miss the sign for it, and you have to go through a shop to reach it. I can tellyou now though, that it is on the pedestrianised bit of Sauchiehall, pretty much opposite Deichmann and above Henderson Jewellers. Lauren and I stopped there for a milkshake. Apparently, the actual tea rooms upstairs are supposed to be rather nice. However, when we got there, only the atrium bit directly across the jeweller's wasaccessible and quite dissapointing. We then went shopping along Sauchiehall and Buchanan Street, killing some time and enjoying the variety of shops...Carlisle's offer is rather limited in comparison. Ah well, we're girls after all, so what did you expect? I even managed to find a nice summer dress that I can't wait to wear....now it just gotta warm up quite drastically over the next few weeks and it's all good! Before catching the train back home, we visited Glasgow's "Malt Whiskey Pub of the Year" the Pot Still on Hope Street. A quite old-fashioned but comfy pub, they have over 500 whiskeys for you to choose from, as well as a pretty good collection of beers and ales on tap. I got to sample their "Whiskey of the Month", Talisker, which was a bit too smoky for my liking, but great to try anyway. I had only been to Glasgow once before, and we stayed around Merchant City. I didn't like Glasgow the first time round, it looked like any industrial town to me. I didn't think that Glasgow could manage to change the first impression I got of it in 2005, but I've got to admit I was quite impressed this time round. It is actually a rather nice city. There are plans to increase university tuition fees (which are at a soaring £ 3,145 already) to even higher rates of £5-7k per year!! This would mean that higher education in the UK would only be accessible for the priviledged few! However, you CAN do something against it, and sign a petition on No. 10 Downing Street's official website! Please help! It all started with that blog I told you about the other day. Berlin Love Story. A blog that follows an Australian girl through her explorations of Berlin. Now I had the idea of setting up another blog, very much like this one, as a "Postcards from Conny"-kinda-blog in which I write my postcards in English and tell you all about my travels and hidden gems I uncover. Talking this suggestion through with my boyfriend, the idea of a proper student travel website which also includes feature articles, tipps & tricks, blogs, a forum and pictures was born. It's still early days (the idea came up on Friday) but the website will be a proper one for a change! It'll even have a "co.uk" domain!! (I know, because I already bought it). However, I am not good at html or Dreamweaver, so I am currently looking into the best options to host and edit it, which I could manage as well! If anyone has any expertise in that field or has any suggestions, I'd appreciate if you could just drop me a line! Right, I've decided to resurrect my YHA membership card again! But not just that! 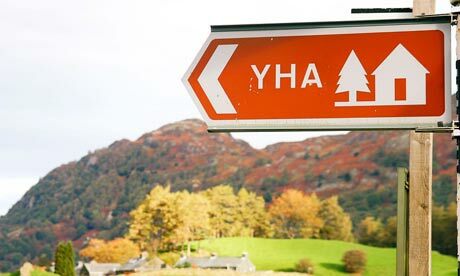 Since my aim is still to become travel journalist, I will try and work in a YHA in the UK for about 2 months in the summer. 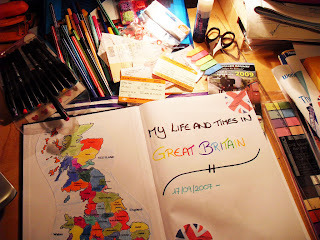 And the best thing: I can still write about my experience and meet travellers! Just think it through! It'd be perfect! I could live on site and save rent, actually make some money, work with travellers and discuss the latest travel gossip and maybe listen to an inspiring travel story or two... Maybe I'll even find some inspiration of where to go or what to do in the UK!! Here's a modern Love Story. A love story of two, who couldn't be any more different. One is a city, the other an Australian girl. 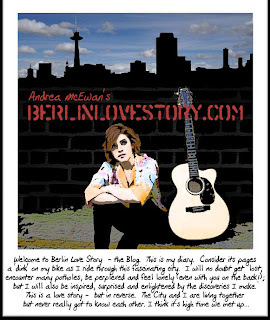 It's Andrea McEwan's Berlin Love Story, a blog in which this Australian singer discovers the city she lives in. She explores Berlin, and as she puts it "The city and I are living together but we never really got to know each other. I think it's high time we met up..."
Providing insight into Berlin and meeting up with some of characters that make Berlin the fascinating place it is, she also gives advice for travellers on where to go and what to check out! It's amazing how much you can learn about a city when you look at it through somebody elses' eyes. A native Berliner will point out different things than a tourist, and a German visiting the capital will see different things to what a foreign national living in the city will see. Berlin, in effect, is one big adventure playground, no matter what your interest is. There are treasures and gems hidden throughout, and going on this treasure quest is really what any kind of travelling should be about. There's a lot to discover - from obscure little places, to whole sub-cultures - just keep your eyes and ears open and stray away from the well-trodden tourist paths. Although the city stays the same, it is different each day. Beating the crowds at the Pergamonmuseum to see the special exhibition of Babylon; being invited into a Pankow backyard for a BBQ; taking the subway and bus around and away from the tourist spots - all very different from standing on top of the Reichstagsgebaeude, strolling down Ku'Damm (Kurfuerstendamm), shopping at the KaDeWe (Kaufhaus des Westens) and walking along the Berliner Mauer at East Side Gallery - and yet all of these experiences make up Berlin. Stroll into the yards at "Hackesche Hoefe", listening to buskers in the subway tunnel underneath Alexanderplatz, explore all the different suburbs of Berlin and their quirks and ways of life. Andrea takes you around the German capital with her.... and who knows? Maybe, you too will fall in love! This blog is a widget now! Get the Conny's Corner Blog widget and many other great free widgets at Widgetbox! I know that some readers who don't know where I am from (or don't know their German geography too well) have asked whether I, my family or friends were affected by the shootings yesterday. Let me assure you, we're all accounted for! Winnenden, the town were 16 people (mostly students) were shot dead yesterday is 385km (239 miles) away from where I grew up. Solingen, my hometown, is near Cologne and Düsseldorf in the German state Nordrhein-Westfalen, while Winnenden is close to Stuttgart, Baden-Württemberg. Thank you for your concern, though! The bodies of the last two missing persons have been found under the debris. The body of a 17-year-old baker was found on Sunday, while another body was recovered today. It is assumed, that the body found today is that of 24-year-old Design student Khalil G. He was found in a 9m deep hole, where the building had collapsed into the subway tunnel below. 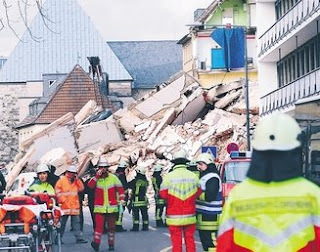 Both men were tenants of the houses adjacent to the City Archive, which partly collapsed along with the Archive building on 03.03.2009. Meanwhile, 25% of the documents formerly housed in the Archive were recovered and are reported to be mostly intact. A canopy has been built over the debris, to protect buried documents and items from the elements. Hmpf....*sigh* .... Where to start?? I had a coffee and a talk with my friends and course-mates earlier today, and we got talking about the course and whether we can actually see ourselves working as journalists. And that's pretty much where the dilemma starts. I came to England 1 1/2 years ago, because this university, the University of Cumbria *clear throat* is the only place in all of EUROPE offering a B.A. (Hons) in Travel Journalism. It sounded like a great course! It would be a journalism degree with some tourism modules on the side. We would have the chance to meet people working in the industry, plan and go on our own research trip in Year 2, learn all the skills needed to survive not only in the journalism world, but also in the travel journalism world in particular. And then I got here. Here is Carlisle (Cumbria, UK), a place where the nearest airport is 1 1/2 hours by train away, where fell-walking in nearby Lake District is the main tourist attraction and the spoken language is (at least for foreigners, sometimes) almost incomprehensible. You'd expect a course like this in a thriving place, a touristy place - a European metropolis... instead you end up with the cows and sheep in Rickerby Park to provide entertainment. Thanks. I got accepted into the University of Central Lancashire, but when I got to Carlisle, I found out it's actually UCLan's Business School and the Cumbria Institute of the Art (C.I.A. ), united as the newly formed University of Cumbria, together with St. Martin's College. Travel Journalism is clearly a journalism degree (the title would be a give-away), however, it is run by a Business School. From the word go we had problems, as we're enrolled at the Business School site, but actually study most of the time at the Art College. We're part of both and don't belong to either. On the one hand, we're doing a journalism degree - just without any of the NCTJ qualifications we'd need to work as proper journalists in this country. I always thought a journalism degree should give you a bit of insight and practice in all areas media - I'm only allowed to do PRINT. Unlike the "proper" journalism students, I'm not allowed to have an elective, go into broadcast and be a radio or TV presenter or make documentaries. And that, although I could imagine myself to work on the "destination pioneering" team of such shows like "VoxTours" or "Wolkenlos". The way I see it, this course will give me the basis of journalism, and the basis of tourism management, but it will not qualify me in either. When I think about travel journalism, I imagine writing for guide books like Lonely Planet or the Rough Guides. I see travel supplements of weekend papers. See travel shows and documentaries on TV. We're not doing any of this. All it would take is for our lecturers to actually get together and discuss our course. Everytime I write a travel piece for journalism, it gets turned down. The magazine I'm editor of now ("Horizons") will feature quite a few travel-related stories, but our lecturer was not impressed and didn't want a travel magazine. But after all, I am trying to do a degree in this!! A bit of help would be nice. Why not change one of our assignments to "Write about Carlisle as if it was for a guide book, using the Lonely Planet house style"? That would actually get us somewhere! At the moment, I just think I spent an awful lot of money for an awful lot of nothing! If I'd only wanted to do journalism, I could have stayed home. Would not have had to immigrate to the UK. I could have studied for free or for a tiny percentage of what I'm paying now. I could still live at home. Have my friends around me. Speak my own language. I wouldn't have to go to university at all. I could start as a trainee reporter at my local paper tomorrow and be a proper journalist working for them 3 years down the line. But it's not what I want to do. I've already changed my job expectations to include writing for an entertainment magazine and/or (German) local-but-bigger-than-the-News & Star newspaper! Just because I don't get to do any travel journalism on the travel journalism degree!!! And believe me, I've thought about quitting this course more than once in the last 18 months! I don't think the lecturers really understand that they are messing with our futures! But I'm not a quitter, and I would have wasted a lot of money. That's the only reason right now why I'm sticking with it. Don't get me wrong, I don't know what I'd do without the "journalism gang" this course made me part of! But that's because they're friends, not because they're journalists! Although I always said I that I want to live in an English-speaking country, I never really fancied living in the UK to start with. Add limited funding and being stuck in Carlisle to the experience... I know it's a disgrace for a travel journalist not to travel - but what can I do? Maybe it'll all sort itself out at some point and I'll come to love this country. Who knows? The only one, who's making moving to the UK seem like my best idea ever and brightens it all up is my boyfriend, and I am really, really thankful for that! I am really glad I stuck with the course long enough to meet him last October - especially since I was considering not to return to the UK after last summer! I came to the UK and to the University of Cumbria on a false promise it seems. I've done all I could and played along. It's time the University of Cumbria fulfils its part of the deal, I'd say!!! A 17-year-old gunman started a shooting spree at a German school in Winnenden this morning. The town of Winnenden near Stuttgart was the scene of a tragic school shooting today. Former Albertville-Realschule student Tim K. entered the school around 9.30am and started a rampage, firing into 4 classrooms. He killed ten students as well as 3 teachers. The shooting at the school lasted only a few minutes, but it resulted in the deaths of 13 people, among them ten 14-15-years-old students from Year 9 and Year 10 classes. One of the killed teachers had only started her training placement with the school a month ago. It is reported, that all shot teachers, as well as 8 of the killed students were female, leaving the media to speculate that this crime was targeted at women. Eye-witnesses also recount, that the gunman aimed head-high at his victims. The gunman managed to flee from the scene, although Winnenden got closed off within minutes. While fleeing the scene, Tim K. also shot and killed an employee of the nearby Psychiatry and Neurology Centre. And although police warned drivers not to stop for hitch-hikers in the area, Tim K. managed to hijack a car and force a man to drive him into the town of Wendlingen, 40km away. In Wendlingen, the young man also shot and killed a car seller and his client and it is suspected he was looking for a getaway car. The car showroom was the scene of a bloody shoot-out between Tim K. and the police, during which Tim K. was first wounded in the leg and then shot himself in the head. Two officers sustained serious injuries. The man was described by friends and teachers as a "quiet, young man" who was interested in soft air weapons and horror movies. His father is a member of the local shooting club, and Tim K. accompanied him to the shooting range from time to time, but never trained there. When the house of Tim K.'s parents was searched, police found one gun missing and suspect it to be the murder weapon. German Chancellor Angela Merkel described the shootings as "incomprehensible". "It is unimaginable that in just seconds, pupils and teachers were killed - it is an appalling crime," she told reporters. A service will be held at 8pm tonight at St. Karl Borromäus church in Winnenden to pray for the victims. I couldn't believe it this morning on my way to uni: The sky was (and still is) cloudless and blue, the sun rays warm on my face and for once my coat felt too warm to wear! For the first time this year, it was warm enough to go outside without a coat! The only day of the year that I want it to be winter and snowy is 24th December! 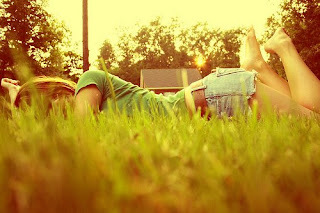 For the other 364, I wouldn't mind a constant summer. Winter is so depressing, while the sun makes you enjoy life to the fullest. The sun puts smiles on people's faces, brings out the colours - makes everything and everyone look and feel so alive! I've got this hobby. I love making scrapbooks! I usually keep tickets and brochures and little things like that from every trip, because I know I'll make a scrapbook about the trip sooner or later. Now I've decided that it's high time I started a scrapbook about "My Life and Times in Great Britain" - or at least my University Years so far. After all, I immigrated to England in 2007 and a lot has happened since then. I love scrapbooking. It helps me bring back memories, relive the moments. And it calms me down. I've always been quite arty and crafty - though I can't draw to save my life - and I just love piecing it all together. Colouring in, cutting out, creating collages of brochure-cut-outs, going crazy with the glue and stickers and everything. It kinda makes me feel like I'm five years old again, in kindergarten, making a card - just on a little more sophisticated level. After all, I can write annotations myself now. This scrapbook about my life in the United Kingdom will probably stay a work in progress - as soon as it's up-to-date something else will happen. I'll take new photos (and those who know me, know how much I love taking pictures), go on another short trip, pick up another brochure. But I won't mind, because I love my hobby. And my life, for that matter. I've just come back from the Beehive Pub, where on Thursdays they have this thing they call "Pub Quiz". I thought it was high time to test my general knowledge again, because I like to think that I'm generally quite knowledgable... erm...yeah. Well, we scored 28 out of 40 points... which is average in all fairness. See I'm usually quite good at the geography questions, and some of the rather obscure general knowledge ones. "What do you call the line at 23.5° latitude?" "Tropic of cancer". "What burns at 451° Fahrenheit?" "Paper"... I know that kind of stuff.... I'm getting better at the music questions as well! But I've noticed that many questions in British pub quizzes are about Sports. And I'm shocking at those! Why? Because I couldn't care less about sport! Same as the picture round... as I don't have a TV, I don't know half the people! Anyways. I enjoy a good quiz! It's all good fun in the end! The historic city archive of Cologne collapsed today. Six out of nine missing persons have been found, firefighters and police are still searching for the missing three that are believed to be buried under the debris. As German media WDR and RTL as well as CNN reported, the building that houses 1000-years-old documents broke apart like a house of cards earlier this afternoon. Eye witnesses speak of loud and weird noises prior to the collapse and all employees managed to escape in time. However, the building caused the adjacent blocks of flats to collapse as well, and it is believed that the missing persons are tenants. 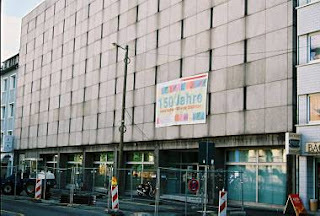 It is speculated that the construction of a subway track underneath Severinstraße (where the City Archive stood) is responsible for the collapse, but city planning officers are denying any knowledge of on-going construction work near the site. Watch the videos here if you can speak German! 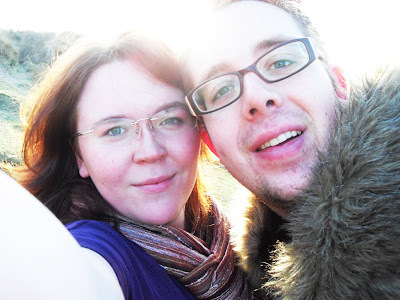 Last weekend, my boyfriend took me on a "Magical Mystery Tour" of rural North Wales! Since my geographical knowledge of Wales is shocking at best (as much as I hate to admit this), I was hopelessly lost as soon as we left the coast. Easy play for him indeed, to just drive me wherever.... I had no clue where we were going and couldn't pronounce half of the places we passed. Being the sucker for roadtrips that I am, I loved the drive down there already! The changing scenery as we turned south from Llandudno Junction towards Llangollen; driving along the backroads in a Mini that's been around for a quarter of a century and most importantly the lovely company I was in! Pure bliss! Then we stopped in this really small, old, rural town called Carrog, where I finally found out what the plan for the day was! We bought tickets for the train. In all fairness, though, I'd been taunting him about a birthday gift and wouldn't tell what it was, so he did the same with this trip! The station looked just like I'd imagined an old, rural, British station to look like! Two tracks, small bridge linking the two platforms, small covered waiting area and teahouse on the platforms, so travellers could pass the time in between trains. Red brick buildings in Victorian style, with yellow/white accents. A small ticketing office. I loved it! Then again, I grew up with trains and railway stations. We were taking the vintage steam train on the Llangollen Railway line from Carrog to Llangollen and back! We could see it coming into Carrog from our spot on the sun terrace at the Inn. The valley filled with smoke. We had to run so we wouldn't miss it. The sight of the train amazed me though! Old first and second class red carriages, and a locomotive steaming up and ready to go! The first class carriages had private compartments, which unfortunately had all been taken by the time we boarded. Being used to modern day Virgin and Transpennine Express trains, as well as Regional- and S-Bahnen and ICE's in Germany, sitting down on a proper, upholstered bench in second class made a nice change. We didn't sit down for long though. To fully appreciate the scenery, we got up, rolled down the glass window in the door and peered out. Wind in our hair, a little steam in our eyes we enjoyed the ride through Glyndyfrdwy and Berwyn to Llangollen (and don't ask me how to pronounce that place that's never heard of vocals... I wouldn't know!). I hadn't been on a steam train since my childhood and it really felt magical - made twice as romantic by going on this trip with my boyfriend! In Llangollen, we had just enough time to have a pint at the Corn Mill pub, just across the river Dee from the Llangollen railway station, before we had to catch the train back to Carrog. 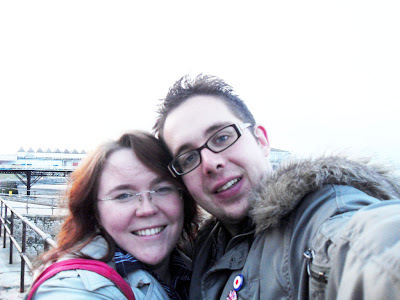 Again, we braved the February weather and sat on the sun terrace, overlooking the river and the railway station with the steam train we'd just come into town on. Returning early to the train, we found ourselves a first class compartment. That's what train travel should still be like! It would make taking the train special again! Once back in Carrog, we got back into the Mini and drove the 8 miles to Llangollen where we continued on to the Pontcysyllte Aqueduct. We walked on the aqueduct, took in the views of the Thomas Telford Aqueduct just a few miles further away, and had another (non-alcoholic) pint in a beer garden at the mooring site for the canal boats. On the way back to the coast, we took the Mini up Horseshoe Pass. The views were amazing and I can only imagine what it would look like in summer! Stopping off at Colwyn Bay for a view of the old pier made a fantastic ending to a great day out! I loved every minute of it! I will be the editor of the next student magazine produced at the University of Cumbria! Molly has agreed to be joint editor with me, which is good because I have no idea what to do while she has been editor before! We have very little time to put the magazine together, as we're going offstone on 31st March, which means our copy deadline is 17th March. I've now had all the jobs there are on the student publication. I've been a writer, a proofreader, a sub-editor, picture editor and webmaster... now I'm in charge, although I'd rather be a writer and sub. Ah well... we'll see how it goes. I'll do my best, promise!